The ventricular system is a set of communicating cavities within the brain. These structures are responsible for the production, transport and removal of cerebrospinal fluid, which bathes the central nervous system. In this article, we shall look at the functions and production of cerebrospinal fluid, and the anatomy of the ventricles that contains it. Cerebrospinal fluid is an ultrafiltrate of plasma that surrounds the brain and spinal cord. Protection – acts as a cushion for the brain, limiting neural damage in cranial injuries. Buoyancy – by being immersed in CSF, the net weight of the brain is reduced to approximately 25 grams. This prevents excessive pressure on the base of the brain. Chemical stability – the CSF creates an environment to allow for proper functioning of the brain, e.g. maintaining low extracellular K+ for synaptic transmission. The ventricles are structures that produce cerebrospinal fluid, and transport it around the cranial cavity. They are lined by ependymal cells, which form a structure called the choroid plexus. It is within the choroid plexus that CSF is produced. Embryologically, the ventricular system is derived from the lumen of the neural tube. Fig 1.0 – Bird’s eye view of a cast of the ventricular system of the brain. In total, there are four ventricles; right and left lateral ventricles, third ventricle and fourth ventricle. The left and right lateral ventricles are located within their respective hemispheres of the cerebrum. They have ‘horns’ which project into the frontal, occipital and temporal lobes. The volume of the lateral ventricles increases with age. Supra-optic recess – located above the optic chiasm. Infundibular recess – located above the optic stalk. 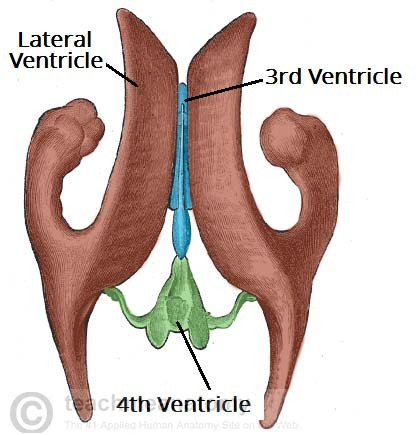 The fourth ventricle is the last in the system – it receives CSF from the third ventricle via the cerebral aqueduct. It lies within the brainstem, at the junction between the pons and medulla oblongata. Subarachnoid cisterns – bathes the brain, between arachnoid mater and pia mater. Here the CSF is reabsorbed back into the circulation. Fig 1.1 – The anatomical positioning of the ventricles of the brain. Cerebrospinal fluid is produced by the choroid plexus, located in the lining of the ventricles. 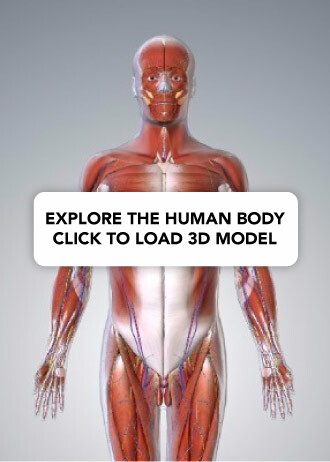 It consists of capillaries and loose connective tissue, surrounded by cuboidal epithelial cells. Plasma is filtered from the blood by the epithelial cells to produce CSF. In this way, the exact chemical composition of the fluid can be controlled. Drainage of the CSF occurs in the subarachnoid cisterns (or space). 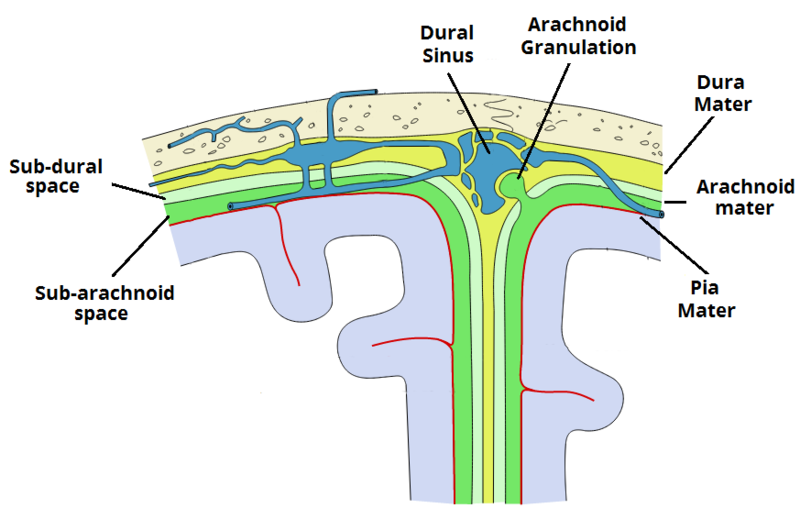 Small projections of arachnoid mater (called arachnoid granulations), protrude into the dura mater. They allow the fluid to drain into the dural venous sinuses. Fig 1.3 – Coronal section of the skull, meninges and cerebrum. An arachnoid granulation is visible in the centre. 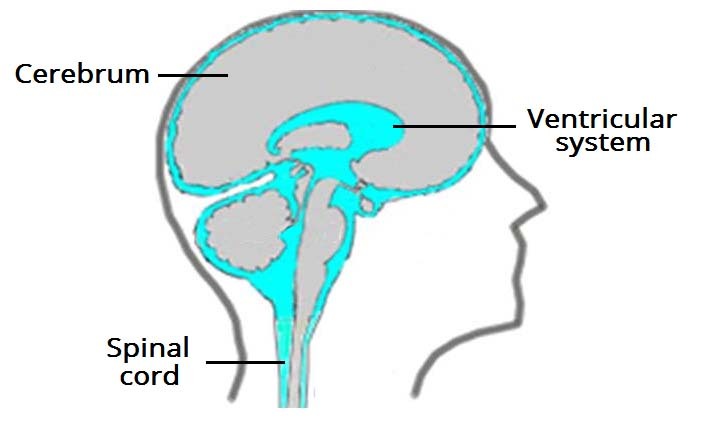 Hydrocephalus is defined as an abnormal collection of CSF within the ventricles of the brain. It is a serious condition, with chronic hydrocephalus causing raised intracranial pressure, and consequently cerebral atrophy. Fig 1.4 – Hydrocephalus on a CT scan. Communicating (Non-obstructive) Hydrocephalus – Abnormal collection of CSF in the absence of any flow obstruction in the ventricles. Common causes usually involve the functional impairment of the arachnoid granulations, such as fibrosis of the subarachnoid space following a haemorrhage. Non-communicating (Obstructive) Hydrocephalus – Abnormal collection of CSF, with flow obstructed within the ventricular system. The most common site of obstruction is the cerebral aqueduct, connecting the third and fourth ventricles. There is also a third classification, hydrocephalus ex vacuo – this refers to ventricular expansion, secondary to brain atrophy. This is often seen in patients with neurodegenerative conditions, such as Alzheimer’s disease. Treatment of hydrocephalus primarily involves reversing the cause. Whilst treating the cause, a shunt can be inserted, which drains the fluid into the right atrium or the peritoneum. Where is cerebrospinal fluid produced? 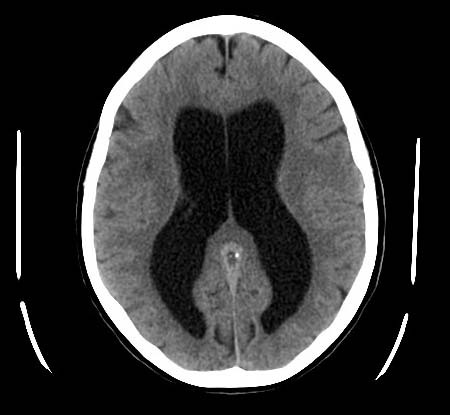 A patient is seen in ED with recurrent headaches. Further investigations reveal raised intracranial pressure and obstruction of the cerebral aqueduct. What type of hydrocephalus is most likely? What type of epithelial cells surround the choroid plexus?